In order to understand how human collective action is motivated, coordinated, governed and evolved an original framework of biocultural power is proposed. Biocultural power is the language enabled human capacity to produce, reproduce and evolve the cultural representations and institutional rules that constitute and regulate the capacity to choose to do things together that could not be done alone. 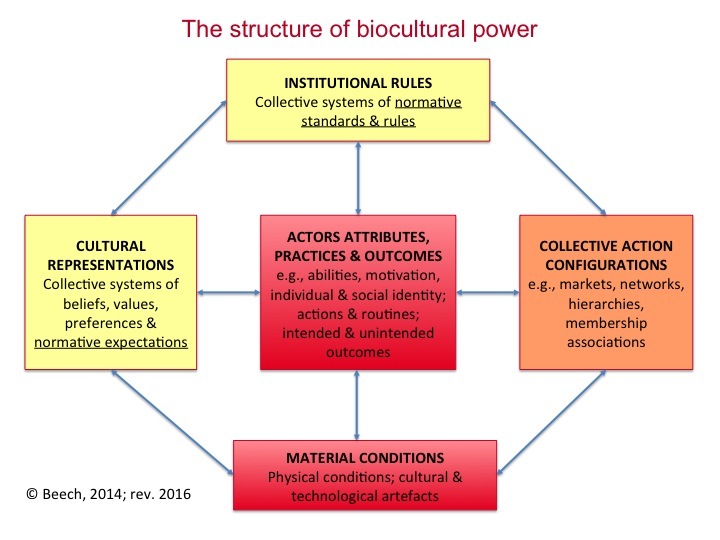 This paper proposes that biocultural power involves interactions between a range of interdependent and interpenetrating components that can be grouped into five broad categories: human actors and their attributes practices and outcomes; material conditions and artefacts; interaction configurations; institutional rules; cultural representations. As with other animals interaction among humans produces interaction configurations and game equilibria. Perhaps unique to human beings interaction produces first, joint intentionality and second, and decisively, collective intentionality and cultural representations (Tomasello, 2014). As argued by Searle (1995; 2010), with supporting empirical evidence from Tomasello, the constitutive and regulative rules of language are the foundational institution of the human species. Institutions are evolving systems of established rules that enable and constrain human life, e.g., language and marriage. The meaning of language is created – meaning is constituted – through the collective intentionality and cultural representations of human beings and enables the creation of new institutions. For example, the institution of marriage is constituted via language, initially sanctioning a relationship – interactive practices – between a woman and a man, governed by community laws. And laws are constituted by collective intentionality and associated cultural representations. Changes in cultural representations about the meaning of marriage have resulted in changes in institutional rules constituting and regulating marriage in some polities, enabling the preferences and interactive practices of two adults of the same gender to be accorded the status of marriage. Thus, the proposed framework supports conceptualisation of institutions as constitutive and as regulative rules, and goes beyond Hindricks and Guala’s (2015) conceptualisation of institutions as rules-in-equilibrium.